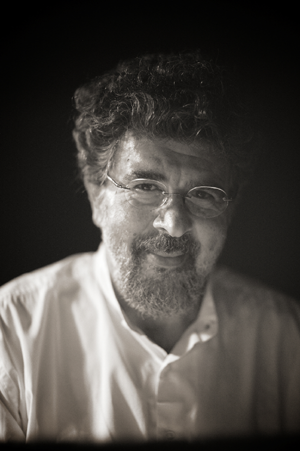 Born on October 7th 1949 in Lebanon, at the age of seven Gabriel Yared’s father sent him to an accordion teacher. It was two years later when he actually stopped his accordion lessons to start learning music theory and play the piano; these are the roots of an illustrious musical career that has created some of the best film scores of our time as well as ballets (Shamrock, Le Diable Amoureux, Vu d’ici, and Clavigo) and his concert works. “As a composer, I am a real introvert. I find the images inside me, prompted by, inspired by the words and the magic of the memory process,” explains Yared. A self-taught musician, in 1969 at the age of twenty he moved to Paris. 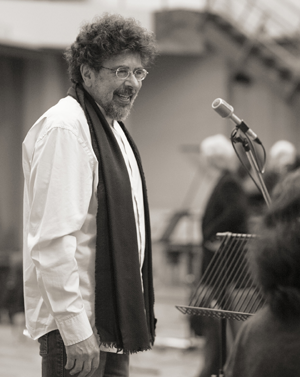 When Gabriel arrived in France he studied as a non-registered student at the Ecole Normale De Musique with Henri Dutilleux and Maurice Ohana Yared worked as a composer, orchestrator, and producer for such singers as Françoise Hardy, Charles Aznavour, Gilbert Bécaud and Mireille Mathieu. He made his film debut in 1980 with the score for Jean-Luc Godard’s Sauve qui peut (la vie). Over the years Yared has been nominated as well as won multiple awards for his work in La lune dans le caniveau, Hannah K, 37.2° le matin/Betty Blue, Agent Trouble, Camille Claudel, L’amant/The Lover, Map of the Human Heart, Des feux mal eteints, Les marmottes, Wings of Courage, Noir comme le souvenir, Azur et Asmar, The Lives of Others, Adam Resurrected, The No. 1 Ladies Detective Agency, Cold Mountain, and City of Angels. In 2000 he received an Academy Award nomination for best original music score, a Golden Globe Award nomination for best original score for a motion picture, a nomination for an Anthony Asquith Award for Film Music, the Broadcast Film Critics Association Award for best score, and the Sierra Award nomination for best score by the Las Vegas Film Critics Society for The Talented Mr. Ripley. However his greatest award achievements to date came in 97 and 98 with a Golden Globe Award for best original score for a motion picture, an Academy Award for best original dramatic music score, an Anthony Asquith Award for Film Music from the British Academy of Film and Television Arts, a Golden Satellite Award for outstanding original score from the International Press Academy, a Grammy Award for best instrumental composition written for a motion picture or for television, the grand prize from the National Academy of Recording Arts and Sciences, Society of Authors, Composers, and Editors of Music, and the Victoire de la Musique Award for The English Patient. Recently he was nominated for a Golden Satellite Award for his score to Amelia. “Yes, I always play the piano and all the keyboard parts including the synthesizers and samplers.” I had just seen Amelia only days before our interview so I mentioned to him that I really loved the music, but my only concern is that I wished the score was louder in certain parts of the film. “It’s not necessarily louder; maybe the effects could be a little quieter. This is s a problem in the film industry usually, that you want to make everything so clear and so understandable to the audience that you push every single thing. It doesn’t mean when you are in a plane that you have to hear the engine of the plane and so many times I’ve asked that well, please quiet the engine because we know we are in the plane and let’s play the music. In order to be poetic and subliminal to audiences one has to completely forget about realistic sounds and noises, but it really doesn’t happen in this business,” responds Yared. After forty minutes had passed Gabriel’s classic cuckoo clock sound ran out, “Ding, whirl, cuckoo, cuckoo, ding, ding, cuckoo, cuckoo.” It was time for Gabriel to go, our interview was over. I had been inspired by the real thing, a maestro of our time; however I was really fooled by that cuckoo clock sound. “This is my ‘personal’ ring tone for my mobile since nine years!” he explains. Maybe he was pulling my leg; I mean this cuckoo clock sounded real, just like a classic. Echoes of a class act remain in what you’re about to read, a desire and passion that’s original, different, and musically diverse; it’s the magic of the words and one man’s memory that is classical in every sense of the word. What inspired you to pursue a musical career in 1971? I was born as a composer in a family where there’s no artist whatsoever. I’ve had a deep interest in music since my very early childhood and this interest was fueled by playing music on the organ in Beirut when I was fifteen. I’m completely self taught until the age of twenty and then in 1971 I moved to Brazil and this really inspired me, written wise, the harmonic acuteness and the originality of the melodic lines in Brazilian songs, this has been implanted in my mind and in my culture. So I began writing for and playing with a small group of musicians in Rio de Janeiro. At the time I was really convinced and drawn to music as my form of expression, but I was not looking to work specifically in film, not at all, because I didn’t go to movies and I would spend all my time only reading and playing music. My first opportunity to work in film came along much later when Jean-Luc Godard proposed that I write the music for the film Sauve qui peut (la vie), this was in 1979, so this was very late in my life. Before that I was an orchestrator, composer, and producer, for pop songs in Europe. Did you really love scoring after working with Godard on Sauve qui peut (la vie)? I don’t think so, no. But I came into this film in a very weird way because Jean-Luc Godard didn’t show me any picture, any image, he just said it was a story about ‘this’ and ‘that,’ ‘would you like to think about it?’ This subconsciously became a kind of technique, not method because I don’t like the word. I’m not an image person, I think the greatest inspiration could come from what is not really intonated into images, it comes from reading, from talking, from walking, inspiration doesn’t come to me from looking at images and this is a very unorthodox process in film music. It has started in 1979 and it’s still there. What is the very first thing you do when you go to score a picture? Always when I want to work on a film I have the same approach, I say I want to be involved in the process as early as possible, often before shooting I would like to start. I start by reading the script, by talking as much as possible at length with the director so that I have an early idea of the colors I need to look for in my music. This allows me to truly understand the spirit of the film. At a very early stage I write music inspired by the film rather than an approach scene by scene or shot by shot. If you look at all my films with Anthony Minghella, whether it’s The English Patient, The Talented Mr. Ripley or Cold Mountain, I would say that most of the music has been composed sometimes even before the shooting and after that, when the images come, then I start crafting to the images, but the main ingredients which we call thematic composition and all that comes blind. When I say ‘blind’ it’s not that I have no consideration for the images, but it means that to me one has to think of a project, not only waiting until the image is shot, you have to start thinking very preliminary. That means I cannot do six or seven films a year, I do one or one and a half a year. I’m not very prolific, I don’t do more than two films a year because it takes me a lot of time and I like to spend time on a film or otherwise we keep saying the same thing over and over because we don’t have time to renew our inspiration. What is film music, what should it do for a film? It has a very important role to play. Although this role is very, ah, it’s difficult to define this. What the image and the characters do not say, the music says it. Music reflects what emanates from a situation, it reflects the core of the film, and it’s more something spiritual, ethereal, than factual. Music is not factual. In a way music should speak to the audience’s subconscious, it should reflect and enhance the spirit of a film. Not just to be stupidly sometimes underscoring. In underscoring there’s a word ‘under,’ which I don’t like. Music can make such a vast difference to a scene, narrating to the emotions; therefore you have to work on it at a very early stage, otherwise we come up with our habits. While you’re scoring a scary scene, you come up with all the vocabulary that has been used during years and years in scary scenes or love scenes or whatever, so I think for each film you need a different approach. In each film the conscious has to come up with a new idea for each film, but what is the role of music in a film? I can’t say, apart from saying what is un-say-able. Should film music be another character in the film? That’s what people say, but they don’t even give you time to be another character in the film because when the film directors are hiring, they cast people and all that, but sometimes it’s a year before they start with the music. They should do the same with the composer, so that a composer and his music become part of and a character in the film. It’s easy to say that it is another character, no it’s not! It’s probably the sum of all of the characters because it reflects the spirit of the film and the spirit of the film is all the characters, all the cinematography, all the situations, all the scenes, it has to sum up something and at the same time really be the core of the film. Is the purpose of film music to underscore certain events, characters, or even occurrences in the story, to give the drama an identity? It gives one thing, which you really can’t define it, it gives the spirit. Because music is a spirit anyway, it really gives more than that, it shouldn’t give less than that, it shouldn’t be just underscoring, it should go deep, deep into the core of the film. What led you into scoring Amelia? 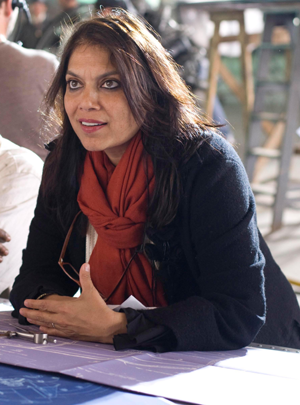 When I was approached by Mira Nair first in November and then later on in February, she asked me to work on her film. I had already scored two films about flying, I did a film with Jean-Jacques Annaud, who did Enemy at the Gates and all that, and I did a film for IMAX, probably the very first film which has been ever done for IMAX, it’s called Wings of Courage. It’s all about flying. So when Mira called me she organized a screening for me in Paris. I looked at the screening, it was at a very early stage, it was a three hour film and then I had many conversations with Mira. I decided to proceed and score Amelia, but she had already shot, she had already started cutting, she had already started temping the edit with temp music. That’s the worst thing that can happen to a composer because the difference is that when you decide to enter a film at an early stage there’s no temp music and your demo’s become the temp music, I used to do this with Anthony Minghella. There was no temp music on The English Patient; there was no temp on Cold Mountain, or on The Talented Mr. Ripley, nor on Breaking and Entering, my demo was the temp and that makes complete sense. 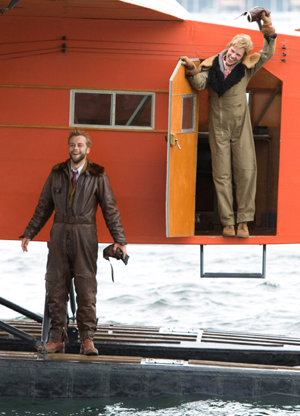 Amelia was not in its early stages, it was already edited and it was already shot. So I decided anyway to go further and to proceed with Mira because I love the person. First we talked on the phone and then I met her in April in New York for the spotting. So you couldn’t really think about the music from reading a script? I didn’t have the script, this time there was no script, but I had the film and the images. What was the very first scene you scored in Amelia and did this composition inspire your complete score? I approached Amelia the way I do all my other films, I begin by reading inside. I look at the images and then I just keep the images in my heart, I start thinking with the remembrance of the images in my mind or in my heart. I begun by searching for the main themes of the film without any picture after seeing the screening, by doing it this way I can capture the true essence of the film. I wanted to capture her ascending feeling; in India they call this nirvana. It was her nirvana in the air and I wanted to capture this with a general main theme. Also I composed some of the flying scenes in a more thematic way than underscore. Underscoring came much later on when I had to spot and look at the images, but firstly I waned to capture the feeling of nirvana when Amelia was up in the air. Also this fire in the belly she had, she wanted to fly, there’s an amazing will and a passion underneath all that. So I haven’t scored a particular scene yet, I just composed music from the remembrance of when I saw the whole film. 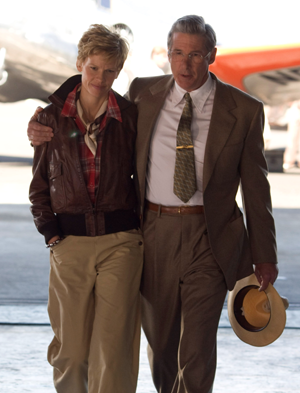 When we came to the spotting, the first sequence I probably scored was when she was flying with Eleanor Roosevelt, which was much more anecdotic. It’s not really using Amelia’s Theme, it’s just flying over Washington D.C., it’s something very busy, beautiful and happy, but the very first thing I did after watching the screening was to compose the Main Theme for Amelia, this, (Gabriel then plays these thirteen notes on his piano for me) and I started sending my themes to Mira from Paris to New York and said, ‘These are my ideas,’ and then she said, ‘Ok, it will get much better if you can put it on the images.’ I started crafting my Main Theme and the flying sequences on images, but its work, back and forth all the time. When you’re crafting it do you use a piano? No, no, no, oh no, oh no. In the old times I used to do it just with the piano, but nowadays one has to do proper demos with all the instruments and orchestration. I’m good at that because I work on Logic Audio and know how to do that. Before going there, once I’ve got my themes and they are approved, I do the work of a composer with all the tools of composition. It means re-harmonizing, adding counterpoint, using as much, every cell of the theme to explore it and to exploit it. Then when all these ingredients are ready I can start working on images. So what I tend to say is ‘My work is not just film composing, it’s composing going beyond all my composition dealing with all the tools of composition, all the work of a composer,’ and then when I’ve got all these ready, then I start working on the images. If you can break Amelia down in parts or themes, please explain the structure of your score? There’s the Main Theme and there are some flying sequences which are important because I wanted something very wide, big, and universal, like a theme from above. I would like to have a theme which is ‘How do you look at the earth from above?’ I did some of these flying themes, but there are these recurring themes in the film and there’s also a lot of underscoring, the underscore is in all of the places where she’s flying for the first time, all this pizzicato, these orchestral colors. 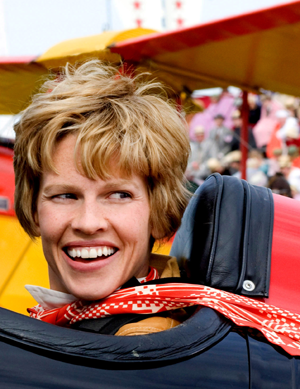 Also when she is about to crash, all this is underscore, but in the main themes there’s Amelia’s Theme which becomes the Love Theme between her and George Putnam, who is Richard Gere, and there’s a third theme which is the Big Flying Theme, the long one, which is like (Gabriel plays his piano again, about twenty notes), this one, I’m playing with one hand, and at the end when Amelia is about to disappear in the ocean, this is a completely different scene which only happens at the end, but it’s a cue that lasts around eleven minutes. This theme had been composed even before the spotting because I knew that she was going to crash somewhere in the ocean. I tried to find something which is repetitive and which goes up and up and up and up until she disappears in the ocean. So I would say there are probably three big themes in the film, but without breaking it into specifics. A really nice sequence was when Amelia drops her scarf out of plane, it floats down through the sky as Mira fades her shot into the wind blowing these white curtains in a room in New York City, where Putnam is in bed and Amelia’s there. I wanted to express this, it’s what we call ‘The fire in the belly,’ I wanted to have this ethnic flute. This is an idea from Mira who knew Ashwin Srinivasan this wonderful flute player from India, he plays all kinds of flutes from India, this really brought a feeling of oneness of this fire in her heart and belly everywhere that she wanted to fly and when the scarf comes down all of a sudden a complete change comes from the symphonic orchestra to something that’s only percussive with this ethnic flute playing. That’s based on the Love Theme. It’s just a diversion; I would say a musical diversion of the Main Theme. Instead of the Main Theme being in major, this times it’s in minor with completely different harmonization and counterpoint. I tend to say that probably with one or two themes you should be able to score a whole film; it’s just about working on the theme and hiding them sometimes. Each time you hear the music you don’t want to think, ‘Well, this is my theme blah,’ sometimes you need to hide it and surround it by different harmonies, not to expose it all the time, but the Main Theme of Amelia, what I call Amelia on the soundtrack and the Love Theme, are the same themes, but they are completely re-explored. 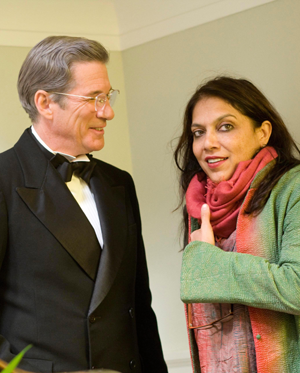 What was unique about working with director Mira Nair? Always a pleasure to work with her, she has a fun spirit and she has clear goals for her film, although she’s not a musician, but she’s also very charming. We had, you know, like a love story you have arguments and all that, we had many ups and downs, but it was great to work with her because she is very generous. I’m an oriental guy and we found each other very similar in just giving your soul, your heart to one another, this is very important. How far do you go to interpret the director’s ideas musically or do you directly respond to your memory of the film? Conversations are very important with the director. I would say conversations are very important as long as the director is not already taken by the temp music, which is the major problem. I’m not talking about Mira, but I’m talking about overall the temp music that many directors and editors use before spotting is something which subliminally they agree on and it becomes part of their film before even the composer has started, so I would say I’d love to have director’s ideas musically as long as it’s not temp music. Sometimes people could tell you while the director is not the composer, not the musician, they will express their ideas in the choice of their temp music. Was Amelia temped with your music? Very few tracks of my music and a lot of other music, what I can tell you about the temp is that it’s very poisonous because even though the director and editor would tell you, ‘Oh it’s nothing, it’s just an indication,’ eventually they get used to it. What they take from the composer they have hired is the most important thing; it’s to be bold and to go somewhere else and also it’s in the breathing. Music is also made of breath, of breathing and once a temp is put on it’s poisonous because it becomes habitual. During my career I’ve found out by working with Jean-Jacques Beineix on Betty Blue or Jean-Jacques Annaud on The Lover or Anthony Minghella on The English Paitent you say, ‘No temp, we need to come up with our own temp.’ You can even give them your own demo. In 1997 the demos were not really great, we didn’t have all these samples and all that, but still there is some unity in asking your composer to bring in the temp music or to choose the temp music or to be part of it, just being part of it makes all the difference in the world. What are the most powerful parts of Amelia, where you felt your music and the director’s vision became one? To me it’s the flying scenes of course, it’s possibly the flying sequences for Amelia’s around the world flight, these scenes look beautiful and show the freedom that she had found in the air and I think the music really tried to match this with her flying. It’s funny because when she’s on the ground (laughter), the music is less interesting because the situation is less interesting, but when she flies the music flies along with her. How important is orchestrating and conducting the score? In a way it makes you guide them, so that’s one of the reasons I don’t want to conduct. I just want to stay with the director and help them understand what’s going on. Listen, I just want to tell you that I don’t have different approaches whether I write for concert or for film, so when I get the opportunity to write music I give my whole heart and soul and skills to film music because to me it’s an excellent opportunity to compose and to blossom. I love both composing for film and outside of film. If something is going to replace or continue the tradition of classical music we have to be very honest and to do it less, but do it better. To me it’s the same, writing for a concert or for a big symphony or writing for film, I’m not talking about all the details of writing for a film and knowing how to penetrate a scene and to support and underscore, I’m talking about the principal itself, about my attitude, my consciousness would be that I would write for a film as if I was writing the best of my music forever. 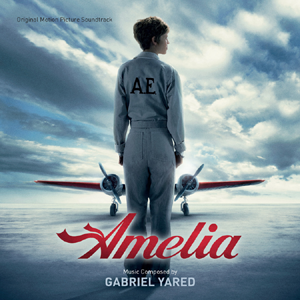 Gabriel Yared's music for Amelia is available on the Varese Sarabande Records label.